Sounders first-round draft pick Tucker Bone from the Air Force Academy is hoping to join a military program that allows elite athletes to train with pro teams. But to qualify, the Sounders need to demonstrate that he's elite enough by offering him a contract. Air Force cadet Tucker Bone knows he must make a quick impression on the Sounders for his professional soccer career to have a shot at taking off. 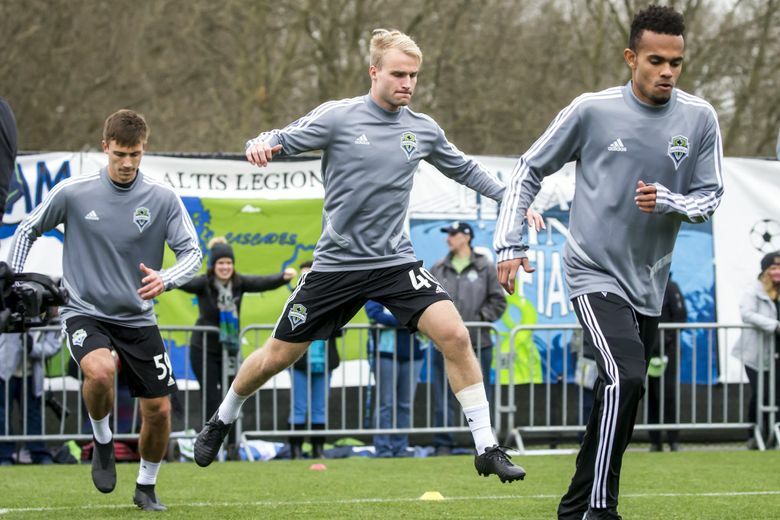 So, Bone capitalized on a holiday weekend and a “snow day’’ to take leave from the U.S. Air Force Academy in Colorado this week and train in Tukwila with a Sounders team that selected him 20th overall in the MLS SuperDraft’s opening round. The Sounders must demonstrate a serious interest in midfielder Bone, 22, for him to qualify for a special military program that allows active duty service members to keep training as elite level athletes. The goal of the World Class Athlete Program (WCAP) is for military members to eventually represent this country internationally in various Olympic sports, so they are allowed in the meantime to train with professional teams. But to qualify for the program, military members like Bone must show concrete benchmarks that indicate they are indeed “Olympic-caliber’’ athletes and not just good ones. Bone getting drafted in the first round was a big step to meeting criteria as an Olympic-caliber athlete for the program. The next will be getting the Sounders to offer him a pro contract, something that won’t happen until he graduates in May and uses his ensuing 60-day leave to work out with them regularly and demonstrate skills alongside other players. The Sounders have been quick to mention that Bone isn’t a part of their organization yet and can’t be until they see more. They liked what they saw the two days here, with Bone twice staying late after practice to work with assistant coaches ahead of the team leaving without him for California on Thursday for the second phase of their training camp. Born in Tacoma, to an Air Force pilot father stationed at Joint Base Lewis-McChord, his family soon moved to Granite Bay, Calif., near Sacramento. There, he took an unusual route to the pros by playing club level Under-17 and Under-18 soccer with Sacramento United before joining the Air Force Academy. Bone scored 13 goals and added six assists in 22 appearances last season and was a semifinalist for the MAC Hermann Trophy – college soccer’s version of the Heisman Trophy – in being named Western Athletic Conference Player of the Year. The Sounders knew they were taking a gamble on his eligibility to play for them, but figured it worth the risk in a draft year that lacked obvious impact talent. They’re hoping he demonstrates enough to earn a spot with their Tacoma team in the United Soccer League, which, on Wednesday, named Chris Little as its new head coach following the departure of John Hutchinson for his native Australia. “For him to come out and be able to say hello to the guys and stuff and be around the group was really good,’’ Sounders general manager Garth Lagerwey said of Bone, who interviewed with eight teams at the recent MLS Combine in Orlando, Fla., where his 3.98 seconds agility time was second fastest among all competitors. But soccer analysts figure some teams balked at drafting him because of his service commitments, leaving the Sounders to hope they might have gotten a bargain. The Sounders have had a mixed bag in their first-round returns of late, with Seattle University product Alex Roldan getting first team playing time right away last season after being picked 21st overall. The prior year’s 22nd overall choice, defender Brian Nana-Sinkam of Stanford, spent a season with the USL squad and then was released. The Sounders traded their first round pick in 2016 to acquire Joevin Jones, while second rounder Tony Alfaro made 25 spot appearances for the first team before signing with Mexican side Chivas this winter. Cristian Roldan became a franchise player for the Sounders after being taken 16th overall in 2015 out of the University of Washington, but defender Damion Lowe, drafted 8th overall in 2014, was limited to USL duty and now plays for a second-tier Norwegian side. Forward Eriq Zavaletta was taken at No. 10 overall in 2013 and eventually became a championship team mainstay – albeit for Toronto FC – after five appearances for the Sounders and a 2015 trade. So, nobody is really sure what the Sounders will get out of Bone, only that he has a few obstacles to overcome first. Bone nearly had a much easier path to the pros after the Department of Defense revised its longstanding rules that required at least two years of active service before athletes could begin pro careers. Before the change, Dallas Cowboys star Roger Staubach and San Antonio Spurs legend David Robinson had been among those who famously had to wait before launching Hall of Fame careers. The new pro sports policy allowed former Navy football players Joe Cardona and Keenan Reynolds to play in the NFL right away. Unlike Bone, both had been ineligible for the WCAP program because football is not an Olympic sport. But then, in 2017, Defense Secretary James Mattis rescinded the policy, leaving the WCAP route as Bone’s only option. Mattis resigned last month and nobody is yet certain whether successor Patrick Shanahan will again loosen the two-year wait period and make things easier on Bone and others. Bone has a minimum five-year commitment to the Air Force after graduation, but can opt for pilot training later and a 10-year commitment. Bone said the proximity of JBLM to the Sounders should help his WCAP qualifying efforts, since it makes it easier for him to report in regularly.